← Healthy Italian French Bread Pizza! In Louisiana, Gumbo is a tasty tradition. By definition, it is a stew or soup that originated in southern Louisiana during the 18th century. It typically consists primarily of a strongly-flavored stock, meat or shellfish, a thickener, and seasoning vegetables, which can include celery, bell peppers, andonions. Gumbo is often categorized by the type of thickener used: the African vegetable okra, the Choctaw spice filé powder(dried and ground sassafras leaves), or roux, the French base made of flour and fat. The dish likely derived its name from either the Bantu word for okra (ki ngombo) or the Choctaw word for filé (kombo). Several different varieties exist. In New Orleans, what is known as Creole gumbo generally contains shellfish, tomatoes, and a thickener. 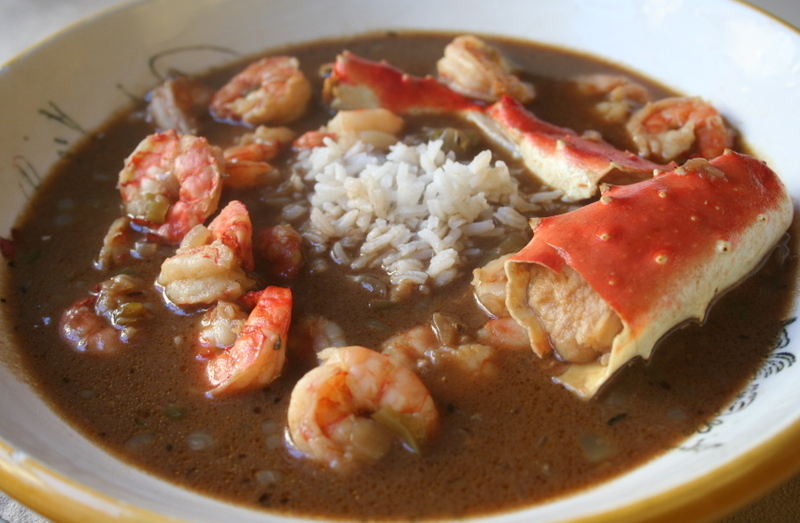 Cajun gumbo varies greatly, but often has a dark roux with either shellfish or fowl. The Creoles of Cane River make a gumbo focused much more on filé. Sausage or ham are often added to gumbos of either variety. After the base is prepared, vegetables are cooked down, and then meat is added. The dish simmers for a minimum of three hours, with shellfish and some spices added near the end. If desired, filé powder is added after the pot is removed from heat. Gumbo is traditionally served over rice. A third, lesser-known variety, the meatless gumbo z’herbes, is essentially a gumbo of slow-cooked greens sometimes thickened with roux, with rice served on the side. Hold off on the salt! – High levels of sodium can adversely affect any persons health or fitness goals, so when enjoying this Louisiana delicacy, use seasonings that do not contain high levels of sodium. Go Green! – Use organic meats & vegetables in your gumbo; It’s better for you, and tastes better too! Go lean! – Portion control with any meal is key to watching your weight; Eat a little bit at a time instead of a huge bowl! Know of a place to get great gumbo? Does Louisiana gumbo mean anything special to you? Let us know by leaving a comment below! For an even healthier gumbo- try brown rice with half a teaspoon of olive oil. Delicious!